You can back up your system files, which creates a restore point you can later use to return your laptop to earlier settings if you experience problems. Just follow these easy steps. Enter Create a restore point in Cortana’s search field and then press the Enter key on your keyboard. In the System Properties dialog box that appears on the System Protection tab, click the Create button. 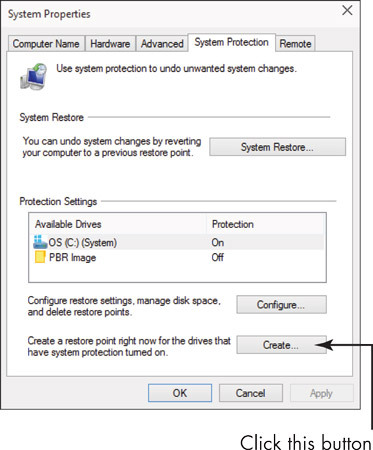 In the System Protection dialog box that appears, enter a name to identify the restore point, such as the name of a program you are about to install, and click Create. Windows displays a progress window. When the restore point is created, this message appears. Click Close to close the message box and click the Close button to close the System Properties dialog box. Every once in a while, before you install a piece of software or make some new setting in Windows, if things seem to be running just fine create a system restore point. It’s good computer practice, just like backing up your files, only you’re backing up your settings. Once a month or once every couple of months works for most people, but if you frequently make changes, create a system restore point more often.